As this folder got...well, a little long, I noticed there was some natural groupings that needed folder. As of right now, I've made the three folders on the right. 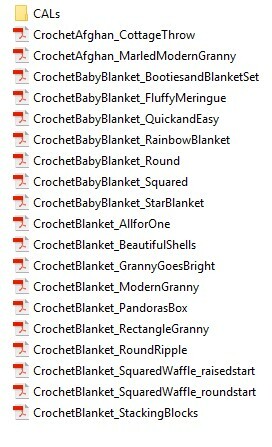 Since I've been on a big crochet blanket/afghan/baby blanket kick lately, I decided to dive into organizing that particular folder further. 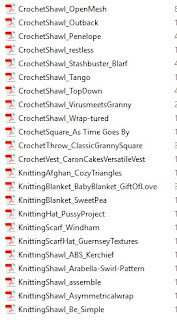 I created two main sub-folders: CALs for patterns released over several weeks (i.e, crochet a-longs), such as the Atlanticus CAL, and then a subfolder called Center Start. Why this folder? Well, I'm secretly very excited to tell you about this genuis idea I had for organization! I've found that I've really enjoyed doing center start blanket projects since I can just use however much yarn I have to make whatever size blanket I can make that many rounds of- baby, toddler/lap, couch blanket....You get the idea. 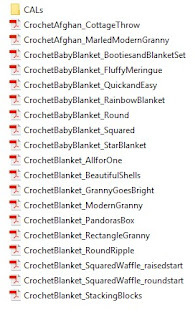 A couple of weekends ago, I went through all of my CrochetAfghan, CrochetBabyBlanket, and CrochetBlanket files (and no, this variation doesn't bother me-to me, it connotes size differences) and created the center start folder underneath the crochet blanket folder. I've found myself using this folder several times as I planned projects for my existing yarn stash. So, there you have it- my system. 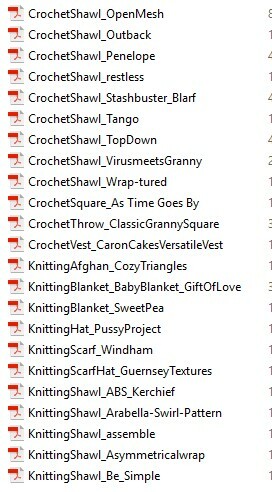 I'd like to figure out ways to "tag" these files for different yarn weights or specific yarns I have in mind, but for now, all I want to know when I go to look for a pattern is CraftType/Thing Being Made and does it need a foundation chain or not. 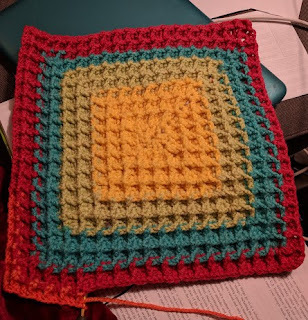 Oh, and this is my current project...And it's a center start crochet blanket, in case you were wondering.